Elections ke liye kuch bhi! Bozos! 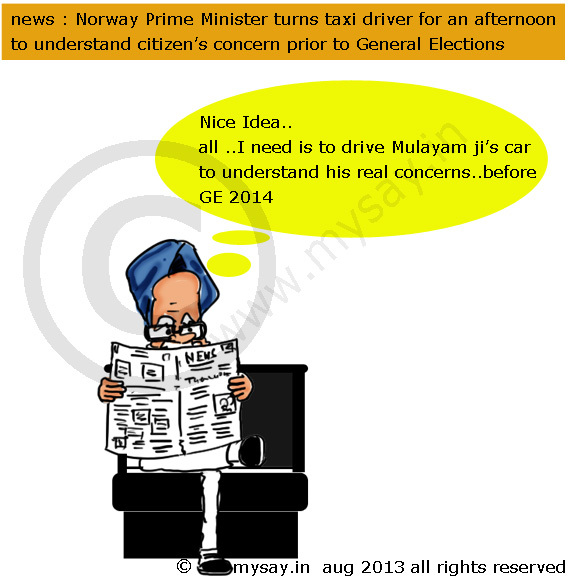 If PM turns into taxi driver, what role will Rahul and Sonia play? yes !! so right .. common India does not sit in taxis .. does not even drive it !! Nice Post. . . Pata nahi India ke Politicians kab Sudhernge.. .
😀 kabhi bhi nahi mujhe lagta hai !! and thats the only achievement you can count for ! Ekdum sahi…PM toh 3 M (Mulayam, Mayawati, Mamta) ko sambhal le vahi kafi hai…apne citizens ko kya sambhalenge!! Our politicians don’t go by ‘of the people, by the people, for the people’, they have just conveniently replaced ‘people’ with ‘regional parties’! Gaadi chalana to door, muh khole to badi meherbaani hogi! We have a bunch of moronic politicians in our country! hahaha .. well its a publicity stunt I feel 😀 but in India politicians do the real work Raowl Baba goes for dinner at a dalit’s house .. and NaMo becomes a Rambo to rescue Gujaratis from Uttarakhand 😀 ..